With potential fuel economy of well over 200mpg and CO2 emissions of just 29g/km, the Kia Niro plug-in hybrid (PHEV) is easily the Korean company's most efficient car to feature a combustion engine ever. 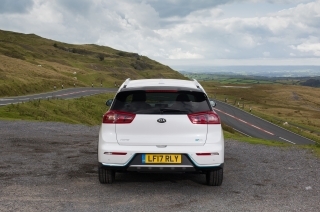 The Niro PHEV will be a cornerstone of Kia's drive to reduce the average CO2 emissions of its range by 25 per cent, based on 2014 figures, by 2020. It is the first plug-in hybrid compact crossover to go on sale in the UK. The Niro PHEV features the same 1.6-litre direct-injection petrol engine as the Niro parallel hybrid launched in 2016, but in this case the combustion engine is paired with a more powerful 44.5kW (60bhp) electric motor supported by a larger 8.9kWh battery pack to extend the car's range on electric power alone. The Niro PHEV is capable of travelling up to 36 miles on the energy stored in its batteries, which means many owners will be able to complete their daily commute without using a drop of petrol or producing any tailpipe emissions. All of this is housed in a stylish and practical crossover package tailored to the tastes of modern buyers. Its horizontally structured interior exhibits the high-quality fit and finish now apparent in every model from Kia, and it is fitted with the latest connectivity and active safety technologies, including Kia Connected Services featuring TomTom®, wireless smartphone charging, Forward Collision Avoidance Assist, Smart Cruise Control and Lane-Keep Assist System. It also offers Android Auto™ and Apple CarPlay™™ which, via pre-dowloaded apps, link smartphones to navigation, music, hands-free calls and texts and voice recognition services. Hybrid sales in the UK and mainland Europe have doubled over the past five years and are expected to reach 700,000 annually by the end of the decade. 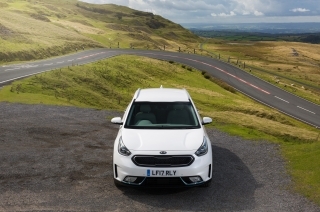 With four hybrids in its line-up – Niro, Niro PHEV, Optima PHEV and Optima Sportswagon PHEV – Kia is perfectly positioned to take advantage of this growing demand. The Niro PHEV is offered in the UK as a stand-alone model based on the mid-range (grade ‘3’) Niro parallel hybrid. The Niro PHEV's highly efficient powertrain, like its crossover design, marks it out as something different in hybrid vehicles. While it pairs a petrol engine with an electric motor like the majority of hybrids, drive to the front wheels is through a six-speed dual-clutch automatic gearbox (6DCT) rather than the more commonly favoured Continuously Variable Transmission (CVT). This gives more direct and immediate response with greater refinement, and it incorporates a Manual Sport mode to allow keener drivers to select gears manually. The petrol engine is the same as that in the Niro parallel hybrid – a new version of the 1.6-litre direct-injection unit from the Kappa family, specifically engineered for use in hybrid cars. It develops 104bhp and 147Nm of torque, and conforms to Kia's policy of adopting high-efficiency downsized power units for all new models. The engine is the first to combine an Atkinson combustion cycle, cooled exhaust gas recirculation, direct petrol injection and a long-stroke specification for maximum efficiency. The Atkinson cycle holds the intake valve open longer than a normal Otto cycle engine and also reduces the compression ratio to extract a greater proportion of energy from the combustion process, rather than wasting it as heat. Efficiency is further aided by an exhaust heat recovery system which speeds the engine warm-up process. In the PHEV, the combustion engine is paired with a more powerful 44.5kW (60bhp) electric motor powered by a larger 8.9kWh lithium-ion polymer battery. Together, the two power units produce 139bhp, with 265Nm of torque available in first gear for rapid acceleration from standstill. The Niro PHEV can cover 0-60mph in 10.4 seconds and has a top speed of 107mph. The greater energy storage capacity of the PHEV's batteries allows the car to travel up to 36 miles on electric power alone. As a result, its official CO2 emissions figure is just 29g/km, so business users pay only 13 per cent company car tax in 2018-19, while the certified fuel consumption figure is 201.8mpg. A brake energy recovery system recoups energy normally dissipated as heat and stores it in the batteries for use later. The in-house 6DCT gearbox has been specially engineered to work with hybrid powertrains. The layout and gear train are light and compact, while the design of the bearings and the use of low-viscosity oil reduce friction, promoting greater efficiency, lowering reaction times and reducing noise. A Transmission-Mounted Electric Device (TMED) allows the combined 139bhp of the two power units to be transferred to the drive wheels simultaneously, with minimal energy losses. This differs from the power-split system typical of CVT transmissions, which convert a portion of engine output for delivery through the electric motor, resulting in a loss of energy. TMED allows the hybrid system to access battery power directly at higher speeds for swifter response. The Niro PHEV is equipped with a number of technological innovations to help it use the power in its battery pack in the most efficient way and top up its batteries on the move. Sophisticated technologies include regenerative braking, a driving style guide, an ECO-DAS (ECOnomy Driver Assistance System) featuring Coasting Guide Control, a Drive Mode Select button so that drivers can personalise the powertrain's dynamics, and an HEV (Hybrid Electric Vehicle) Select switch. It also has an intelligent heating, ventilation and air conditioning (HVAC) system to save battery power. HEV Select gives access to two driving modes via a button in the centre console. In EV (charge depletion) mode the car runs as a purely electric vehicle when the energy stored in the batteries is adequate, and is able to regenerate electrical power on the move to recharge the batteries. HEV (charge sustaining) mode allows the powertrain to balance the use of motor and petrol engine for a seamless combination of electric and internal combustion power. In this mode, a greater proportion of propulsion comes from the petrol engine and the charge level of the batteries is constantly being topped up for later use. Drive Mode Select gives the driver the choice of Eco and Normal settings to obtain maximum energy efficiency or greater performance. This switch is also located in the centre console. A driving style guide delivers information through the instrument panel about how efficiently the car is being driven so that drivers can adapt their driving style as necessary. Kia's regenerative braking system allows the car to harvest kinetic energy – energy created by motion – to top up the batteries when coasting or braking. It is linked to Coasting Guide Control (CGC), which takes information from the navigation system so that the car can anticipate road conditions to reduce energy use and identify opportunities to harvest additional electrical power through coasting. CGC alerts drivers to the best time to lift off the accelerator and coast towards a junction, allowing energy to be regenerated. It also means the driver can brake later and maintain momentum when traffic conditions allow, reducing the likelihood of the need to stop at a junction or traffic lights. CGC operates between 40 and 100mph when a navigation destination is set. It can improve fuel economy by up to 3 per cent. The advanced HVAC system has been adapted from that in the Soul EV, and allows only the driver's side of the car to be cooled when the other seats are unoccupied to minimise energy usage. It does this through a smart air intake, in contrast to rival systems which merely divert the airflow towards the driver when other vents are closed, and consequently do not reduce overall energy consumption. Two battery charging cables are supplied with the Niro PHEV; one with a standard three-pin plug allowing the car to be connected to a domestic socket and a Type 2 to Type 2 cable for connection to a public or workplace charging point. The charge time from fully depleted to 100 per cent charged is two-and-a-quarter hours. The five-door, five-seater Niro PHEV is the world's first compact crossover plug-in hybrid and was a joint design between Kia's studios at Namyang in Korea and Irvine, California. The sleek crossover profile has a low drag coefficient (Cd) of just 0.30, while extensive use of high-strength steel and aluminium in the body construction helps to trim the minimum kerb weight to 1,594kg. Both are significant factors in the Niro PHEV's low fuel consumption and CO2 emissions. The design features the subtly sculpted surfaces and sharp lines that instantly mark the Niro PHEV out as a modern Kia, and includes the latest evolution of the brand's 'tiger-nose' grille as well as the familiar broad C-pillar. A wide stance gives pointers to the car's stability and low centre of gravity, while a long bonnet, short overhangs, elevated headlights and a rising shoulder line are other Kia hallmarks. The body tapers towards the rear, where bold wheel arches, a squared-off bumper with a diffuser section and high-mounted C-shaped tail lights emphasise its dynamic stance. The car's crossover credentials are further highlighted by body cladding beneath the front and rear bumpers, along the sides and around the wheel arches. A subtle roof spoiler aids the car's aerodynamics. The PHEV features 16-inch alloy wheels with plastic covers designed to minimise wind resistance, and there are metallic blue flourishes on the front and rear bumpers. The plug-in charging point is on the left-hand front wing. At 4,355mm long, 1,805mm wide and 1,535mm tall, the compact Niro PHEV sits between the cee'd hatchback and the Sportage SUV in size. Yet with a 2,700mm wheelbase and short front and rear overhangs it provides generous space. This is reinforced by the styling of the interior, which has a wide dashboard set out on horizontal lines. There is an upper display sector with the instrument panel and infotainment screen at the same height, separated by a cabin-wide trim line from the lower control area, where the heating and ventilation and driver assistance switches are located. High-quality, soft-touch materials confirm the car's quality, emphasised by the light grey headlining, 4.2-inch full-colour TFT (Thin Film Transistor) supervision cluster, leather-trimmed steering wheel and gearshifter, high-gloss black inserts in the steering wheel, lower console and door panels, and satin chrome interior door handles. An 8.0-inch touchscreen navigation system is standard. There will be no combustion engine-only Niro. Its all-new platform has been engineered exclusively for electrified vehicles and has been designed to accommodate present and future electrical components within a compact vehicle footprint with minimal intrusion into the spacious interior and luggage area. In the PHEV, luggage space has been slightly reduced to 324 litres to make space for the enlarged battery pack, but this has been partially offset by a reduction in the size of the petrol tank from 45 to 43 litres. A slightly raised crossover-style seating position makes getting in and out easier and provides a superior view out. The structure is particularly strong and includes 53 per cent advanced high-strength steel, which ensures that rigidity and safety do not compromise weight. This is aided by extensive use of aluminium for the bonnet, tailgate panel, front bumper back beam and several chassis elements, including the front knuckles, front lower arms and brake calipers. Even the parking brake pedal, which is made of fibre-reinforced plastic, contributes to the weight savings. To ensure body integrity and rigidity in critical areas, hot-stamped steel is used to reinforce the A- and B-pillars, roof rails and wheel arches. The front seats save 1.3kg each thanks to their high-strength steel frames, yet they are still able to cushion occupants against bumps and vibrations as a result of their high-density foam, while specially profiled springs and pads provide high levels of thigh, hip and side support. By re-engineering some existing components, Kia has been able to create a chassis specifically for hybrid vehicles while ensuring the Niro PHEV is the equal of the brand's other compact models for ride comfort, handling and refinement. The driving characteristics begin with fully independent suspension all round, based on MacPherson struts at the front and a multi-link arrangement with dual lower arms at the rear. It has been tuned to deliver maximum on-centre steering feel, high-speed stability and immediate response to steering inputs. Because each rear wheel is able to absorb bumps independently, shocks are less likely to be transmitted to the cabin than with a cheaper torsion beam rear axle, while the wide stance and low centre of gravity enhance stability. 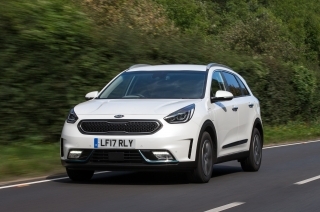 Capitalising on the experience gained through the development of two generations of Optima hybrid (neither sold in the UK) plus the Soul EV, Kia has been able to give Niro consistent and linear deceleration and braking feel unusual in an electrified car. Electronic Stability Control and Vehicle Stability Management, which collectively control skids when cornering or accelerating on surfaces with uneven levels of grip, are standard. The Niro PHEV is also fitted with Forward Collision Avoidance Assist and Smart Cruise Control to assist the driver in avoiding collisions with other vehicles and pedestrians. The car's exceptional refinement proved particularly challenging to perfect because of the hybrid powertrain. Contributing towards this are asymmetric engine mounts to minimise powertrain movements at the attachment points in the subframe, high-density under-bonnet insulation, an acoustic shield with a special support structure to improve the sound of the combustion engine when accelerating in the most commonly used speed ranges, and the adoption of a 6DCT gearbox in place of a CVT. Road noise is minimised by high-insulation rigid bushes in the front subframe, high-strength steel in the rear wheel arches and additional insulation in the A- and B-pillars. The low drag co-efficient (Cd) of 0.30 contributes towards the suppression of wind noise, aided by laminated windscreen glass, a cowl over the front windscreen wipers, specially profiled door mirror casings and – as an example of the attention to detail of Kia's engineers – covers over the holes in the roof rails, which sit flush on the bodywork. An environmental car does not have to be a fundamental car, and the Niro PHEV is available with the most advanced connectivity services and active driver aids. Standard Advanced Driver Assistance Pack includes Forward Collision Avoidance Assist with Smart Cruise Control, Lane Keep Assist System, Hill-start Assist Control and a Speed Limiter. There is an 8.0-inch touchscreen navigation system with European mapping, a reversing camera and Kia Connected Services featuring TomTom®. This provides up-to-the-minute information on traffic hold-ups, weather, speed camera locations and local points of interest. Kia Connected Services is free for seven years from the time the car is bought. A wireless mobile phone charger and an eight-speaker JBL Premium sound system with a 320-watt external amplifier are also standard alongside a DAB radio and Bluetooth smartphone connectivity and music streaming. The Niro PHEV features Android Auto™ and Apple CarPlay™™, which allow smartphones to be paired with the car via pre-downloaded apps. Android Auto™ works with Android smartphones running 5.0 (Lollipop) or higher and gives access to a variety of services such as Google Maps navigation, Google Play music, hands-free calls and texts and voice recognition. Apple CarPlay™™ functions with iPhone 5 or newer and enables full Siri voice control of the phone's apps and functions while linking the car to Apple Maps, calls and text dictation, music streaming and audiobooks. The PHEV is a stand-alone model in the Niro line-up, based on the mid-range (grade ‘3’) Niro parallel hybrid (with ADAP). In addition to the long list of driver aids and connectivity systems, it is equipped with a 4.2-inch colour TFT supervision cluster, a reversing camera and front and rear parking sensors, roof rails, privacy glass on the rear windows and tailgate and LED tail lights and daytime running lights. It also features 16-inch alloy wheels with aerodynamic plastic covers, dual automatic air conditioning, an automatic windscreen de-fogging system, all-round electric windows and electrically adjustable folding door mirrors with LED indicators. A DAB radio, USB and AUX ports, a leather-covered steering wheel and gearshifter, black leather upholstery, chrome interior and exterior door handles, rain-sensing front wipers and an under-floor tray are also standard. The front seats and steering wheel and heated and the front seats have eight-way power adjustment and powered lumbar adjustment on the driver's seat. In keeping with every Kia, the Niro PHEV comes with a unique-in-the-UK seven-year or 100,000-mile warranty, subject to wear and tear conditions. The warranty is fully transferable should the car be sold before the time or mileage limits have been reached. 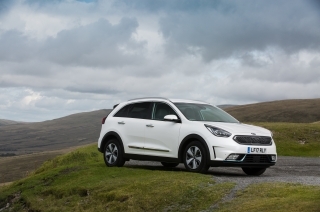 The Niro PHEV is available with Kia’s ‘Kia Care’ service plans, which have been developed to provide customers with a wide range of service plan options for any Kia model within the first seven years of the vehicle’s life – matching its industry-leading seven-year warranty. Bespoke hybrid vehicles, as opposed to those developed from a purely combustion-engined car, have traditionally involved compromises in design, mainly to achieve the lowest air-drag figure possible. That is why the majority have adopted a tear-drop hatchback profile – practical and efficient, but uninspiring and not what customers demand in a market increasingly attuned to SUVs and crossovers. Kia was adamant it could overcome the design limitations of other hybrids without sacrificing practicality, versatility and aerodynamic efficiency. The result is the Niro, a range of hybrids with a modern, attractive crossover body style and ample room for five people plus their luggage. The remarkable feat is that this has been achieved in the Niro PHEV with a drag coefficient (Cd) of 0.30, despite the standard roof rails. To make this possible, Kia designers took a reverse approach during the creation of Niro: design an attractive, sporty, stylish and tough-looking crossover, then fine-tune the aerodynamics to suit the requirements of a hybrid. This novel way of going about things has resulted in a crossover which is appealing in its own right, but which is also a highly efficient hybrid. The stylish crossover lines of the 2016 Niro have been transferred largely unchanged to the PHEV. The few changes are to make the PHEV instantly identifiable for what it is, and for practicality purposes, such as the plug-in charging point on the left-hand front wing. The PHEV also has 16-inch alloy wheels with aerodynamic plastic covers designed to minimise wind resistance, and there are metallic blue flourishes on the front and rear bumpers, while the metallic blue theme is continued on the air vents inside the car and in the stitching for the black leather seats. The PHEV is based on the mid-range (grade ‘3’) version of the Niro parallel hybrid, and features the same chrome-coated exterior door handles, chrome belt-line mouldings, privacy glass on the rear side windows and tailgate, LED daytime running lights and rear combination lamps and body-coloured and high-gloss door mirrors with LED indicators. From any angle, the car exudes dynamism and strength. The body line linking the roof, glasshouse and bonnet adds crossover-style volume to the car, while a wide bumper with bold lines and the now-familiar 'tiger-nose' grille add a distinctive Kia family look. Body cladding on the lower edge of the front and rear bumpers, along the sides and around the wheel arches emphasises Niro's crossover credentials, but there are also subtleties which illustrate the attention to detail of the design and engineering teams to make Niro a legitimate hybrid. An active air flap in the lower front grille opens and closes according to the cooling requirements of the powertrain, so that Niro is running in the most efficient aerodynamic configuration in all circumstances, and there are air curtains, like gills, in the front corners of the car. These channel air away from the front wheel arches to reduce turbulence in those areas, again to aid aerodynamic efficiency. The roof leads into a rear spoiler to direct air over the car in the most efficient manner. The tailgate area is clean-looking and sits over a diffuser which aids airflow under the car. The C-shaped rear lamps are mounted immediately beneath the tailgate glass, while the contours of the wide and deep tailgate emphasise the smooth aerodynamic shape. Even the location of the standard rear-vision camera reduces drag: it is housed within the rear wiper mounting so as not to impede air exiting the rear. The rear corners of the car have been refined in minute detail to reduce drag without worsening visibility. There are specially profiled door mirror casings and – as an example of the attention to detail of Kia's engineers – covered holes in the roof rails, which sit flush on the bodywork. The design of Niro was a joint effort between Kia's studios at Namyang in Korea and Irvine, California. The car features the subtly sculpted surfaces and sharp lines that are now Kia design hallmarks. A wide stance gives pointers to the car's stability and low centre of gravity, while a long bonnet, short overhangs, elevated headlights and a rising shoulder line are other Kia distinguishing features. The body tapers towards the rear, where bold wheel arches, a squared-off bumper and the high-mounted C-shaped tail light clusters emphasise the crossover stance. At 4,355mm long, 1,805mm wide and 1,535mm tall (1,545 with roof rack), the compact Niro PHEV sits between the cee'd hatchback and the Sportage SUV in size. Yet with a 2,700mm wheelbase and short front and rear overhangs it provides generous interior space. Aerodynamic considerations posed many challenges for the teams tasked with Niro's packaging. It was determined early on that Niro would be a compact hybrid crossover – shorter than the Sportage SUV, but longer than the cee'd hatchback. There had to be a limit on height to reduce drag, but this was not to be at the expense of a raised seating position. And space, versatility, ease of entrance and visibility were not to suffer in any way. The result is one of Kia's most efficiently packaged cars ever. Thanks to the long, 2,700mm wheelbase there is generous space for five people. There is up to 1,059mm of legroom in the front and 950mm in the rear; the class-leading headroom of up to 1,018mm in front and 993mm behind is greater than in many C-segment SUVs; and the 1,805mm wide body provides 1,423mm of shoulder room for the two front occupants and only slightly less, at 1,402mm, in the rear. One major difference with the PHEV is that luggage capacity has been slightly reduced from 373 to 324 litres with all five seats occupied because of the enlarged battery pack, although this has been partially offset by reducing the petrol tank capacity from 45 to 43 litres. The boot expands to 1,322 litres – down from the 1,371 litres of the Niro parallel hybrid – with the 60:40 split rear seats folded. The luggage area features an undertray for storing the recharging cables. The ergonomic fascia and information clusters follow what is becoming a modern theme for Kia, starting with a wide dashboard set out on horizontal lines. There is an upper display sector with the instrument panel and infotainment screen at the same height for instant, easier reading, separated by a cabin-wide trim line from the lower control area, where the heating and ventilation and driver assistance switches are located. Inside the cabin, every last nook and cranny has been used for storage of personal items, and there is a tray for wireless charging of mobile devices. The five-seater Niro PHEV has a foot-operated parking brake to release more space for oddments in the centre console, and is fitted in the UK with a tyre mobility kit rather than a spare wheel to reduce weight and ensure the boot is as large as possible. Space-saving front seats with special foam-backed covers and slim headrests contribute to the car's exceptional roominess and also save 1.3kg each thanks to their high-strength steel frames, yet they are still able to cushion occupants against bumps and vibrations as a result of high-density foam and profiled springs and pads. There is smart black leather with blue stitching. A 4.2-inch TFT (Thin Film Transistor) full-colour supervision cluster is standard. High-gloss black inserts in the steering wheel, dashboard and door panels, a leather-trimmed steering wheel and gearshifter, an 8.0-inch touchscreen navigation system and satin chrome interior door handles further attest to the car's quality. The Niro PHEV employs the same 1.6-litre direct-injection internal combustion engine as the parallel hybrid on which it is based. The major difference is that it has a more powerful electric motor and an enlarged lithium-ion polymer battery pack to supply it with energy. The power electronics system includes sophisticated and innovative technologies to maximise the car's range on electric power alone. All of these ensure the Niro PHEV is capable of travelling up to 36 miles on battery power – easily enough for the majority of daily commutes – while producing CO2 emissions of only 29g/km. Its officially rated fuel consumption is therefore 201.8mpg. The platform on which it is based has been designed purely for electrified vehicles, and the transmission, unlike those in most other hybrid vehicles, is a dual-clutch automatic (6DCT) rather than a continuously variable transmission (CVT), improving smoothness, efficiency and refinement. The Niro PHEV's petrol engine is a version of the normally aspirated 1.6-litre direct-injection (GDi) unit from the Kappa family, specifically engineered for use in hybrid cars. It is a long-stroke 16-valve unit with an aluminium cylinder head and block and a steel oil pan. The engine's dimensions remain at 72mm cylinder bore and 97mm piston stroke, and it develops an identical 104bhp at 5,700rpm and 147Nm of torque at 4,000rpm, but in Niro it marks the first combination of an Atkinson combustion cycle, cooled exhaust gas recirculation, direct petrol injection and a long-stroke specification for maximum efficiency. The Atkinson cycle engine was invented by James Atkinson, of Hampstead, at the dawn of the motoring age (he first filed for patents in the mid-1880s), but it is now proving to be an ideal solution for emissions-reducing hybrid cars in the 21st century. It works on the principle of completing all four stages of the combustion process (intake, compression, ignition and exhaust) on just one rotation of the crankshaft, rather than the two required in the more common Otto cycle engine. At the same time the compression ratio is reduced and the intake stroke is shorter than the power stroke, therefore requiring less fuel to turn the engine over. While this inevitably reduces the amount of power the engine can develop, it is less important in a hybrid car which has the assistance of an electric motor, and which in any case aims to maximise efficiency rather than outright performance. With the benefit of continuously variable valve timing on both the intake and exhaust sides of the engine, the new Kappa unit is easily able to achieve the variations in compression ratio and piston stroke required by the Atkinson cycle. Efficiency is further aided by an exhaust heat recovery system which speeds the engine warm-up process. The Kappa Atkinson cycle engine features isolated cooling technology which prevents the cylinder head and block from overheating while reducing knocking and friction. Sodium, which has high thermal conductivity, is used in the hollow exhaust valves, and friction losses have been reduced through tapered roller bearings and low viscosity oil. The engine's thermal efficiency of 40 per cent is among the best in the global auto industry. In the Niro PHEV, the combustion engine is paired with a permanent magnet synchronous electric motor developing 44.5kW (60bhp) from 1,798 to 2,500rpm, and 170Nm of torque from rest to 1,798rpm. This compares with the 32kW (43bhp) developed by the electric motor in the Niro parallel hybrid. Power to the motor comes from a 360-volt lithium-ion polymer battery capable of storing 8.9kWh of electrical energy. The parallel hybrid's battery is a 240-volt system capable of storing 1.56kWh of energy. Battery weight rises from 33 to 117kg as a result of the increased size. Together, the two power units produce a maximum 139bhp at 5,700rpm, with 265Nm of torque available in first gear from 1,000 to 2,400rpm. The result is extremely brisk acceleration from standstill and in typical urban scenarios, where Niro is most likely to be found, with effortless cruising ability at the speeds permitted in the UK. Acceleration from standstill to 60mph is achieved in 10.4 seconds, 0.7 seconds faster than in the parallel hybrid, and the PHEV's top speed is 107 rather than 101mph. The battery pack has up to 50 per cent greater power density and 13 per cent greater energy efficiency than the systems in rival hybrid cars. The battery cells have a ceramic coating between the cathode and anode sides, a Voltage Protection Device, a dedicated battery management system and an integrated control system, all to improve safety, minimise fire risk and ensure reliability and ease of maintenance. The Niro PHEV is equipped with a number of technological innovations to help it use the power in its battery pack in the most efficient way and to top up its batteries on the move. It is linked to Coasting Guide Control (CGC), which takes information from the navigation system so that the car can anticipate road conditions to reduce energy use and identify opportunities to harvest additional electrical power through coasting. CGC alerts drivers to the best time to lift off the accelerator and coast towards a junction, allowing energy to be regenerated. It also means the driver can brake later and maintain momentum when traffic conditions allow, reducing the likelihood of the need to stop at a junction or traffic lights. CGC operates between 37 and 100mph when a navigation destination is set. The advanced HVAC system has been adapted from that in the Soul EV, and allows only the driver's side of the car to be cooled when the other seats are unoccupied to minimise energy usage. It does this through a smart air intake, in contrast to rival systems which merely divert the airflow towards the driver when other vents are closed and consequently do not reduce energy consumption. The Niro PHEV employs a dual-clutch automatic transmission rather than the continuously variable automatic (CVT) more commonly found in hybrid cars. The in-house 6DCT gearbox is based on the 7DCT transmission fitted to other Kia models, and uses a dry dual clutch to keep weight to a minimum and reduce the friction losses through viscosity which occur in wet dual-clutch systems. The gearbox has been specially engineered to work with hybrid powertrains. It is smoother, more efficient and quieter than a CVT. In normal operation the 6DCT transmission changes gear automatically, with no need for intervention from the driver. One clutch operates the odd-numbered gears (first, third and fifth) and the other clutch is responsible for the even-numbered gears (second, fourth and sixth). The 6DCT is able to work automatically in both Eco and Sport modes, with the latter delaying upchanges until the power unit has attained higher revs for greater performance. But there is also a Manual mode, accessed by sliding the lever to the side when in the Drive position. The driver is then able to up- or downchange at will by rocking the gear selector forwards or backwards. The layout and gear train have been designed for light weight and compact size, while special bearings and low-viscosity oil reduce friction, promoting greater efficiency, reducing reaction times and minimising noise. A Transmission-Mounted Electric Device (TMED) allows the full output of both power units to be transferred simultaneously to the drive wheels with minimal energy losses. This differs from the power-split system typical of CVT transmissions, which convert a portion of engine output for delivery through the electric motor, resulting in a loss of energy. TMED allows the hybrid system to access battery power directly at higher speeds for swifter response. There will be no combustion engine-only Niro. Its all-new platform has been engineered exclusively for electrified vehicles, and has been designed to accommodate present and future electrical components within a compact vehicle footprint with minimal intrusion into the spacious interior and luggage area. The structure is particularly strong and includes 53 per cent advanced high-strength steel, which ensures that rigidity and safety do not compromise weight. This is aided by extensive use of aluminium for the bonnet, tailgate panel, front bumper back beam and several chassis elements, including the front knuckles, front lower arms and brake calipers. The aluminium bonnet and tailgate alone save 11kg when compared with comparable steel components. Even the parking brake pedal, which is made of fibre-reinforced plastic, contributes to the weight savings. The front seats save 1.3kg each thanks to their high-strength steel frames, yet they are still able to cushion occupants against bumps and vibrations as a result of their high-density foam, while specially profiled springs and pads provide high levels of thigh, hip and side support. As a result of all this, the Niro PHEV's minimum kerbside weight is just 1,594kg. To ensure body integrity and rigidity in critical areas, hot-stamped steel is used to reinforce the A- and B-pillars, roof rails and wheel arches. The battery pack is housed beneath the rear seat, while in the PHEV the normal 45-litre fuel tank has been reduced to 43 litres to help compensate for the enlarged battery pack. By re-engineering some existing components, Kia has endowed the Niro and Niro PHEV with a unique chassis specifically designed for hybrids while ensuring they are the equal of the brand's other compact models for ride comfort, handling and refinement. Capitalising on the experience gained through the development of two generations of Optima hybrid (neither sold in the UK) plus the Soul EV, Kia has been able to give the Niro PHEV consistent and linear deceleration and brake feel unusual in an electrified car. All-disc brakes are used, ventilated at the front, and there is a foot-operated parking brake. The anti-lock braking system includes Brake Assist, which ensures maximum retardation in an emergency stop, regardless of the force applied to the pedal by the driver. Steering is via Kia's proven column-mounted motor-driven power-assisted system (C-MDPS), which gives the car a compact turning circle of 10.6 metres and requires less than 2.7 turns of the wheel between the extremes of lock. The steering gear has been mounted well forward and features an increased gear ratio and a larger electric motor for greater self-centring and responsiveness. Agility is also helped by aluminium front suspension knuckles, lower arms and brake calipers, all of which save weight and counter inertia. The Niro PHEV has special aerodynamically shaped 16-inch alloy wheels with plastic covers and rides on 205/60 R16 tyres. Electronic Stability Control and Vehicle Stability Management, which collectively control skids when cornering or accelerating on surfaces with uneven levels of grip, are standard, while Hill-start Assist prevents the car from rolling backwards when setting off on gradients. Passive safety provisions start with the rigidity of the body structure, which is reinforced in critical areas and features crumple zones front and rear and anti-intrusion beams at the sides. There are seven airbags, including one to protect the driver's knees; all-round height-adjustable headrests; height-adjustable front seat belts with an automatic tightening device in the event of emergency braking; ISOFIX child seat top tethers and anchors; and doors which unlock automatically after an impact. The PHEV's exceptional refinement proved particularly challenging to perfect because of the hybrid powertrain. Contributing towards this are asymmetric engine mounts to minimise powertrain movements at the attachment points in the subframe, high-density under-bonnet insulation, an acoustic shield with a special support structure to improve the sound of the combustion engine when accelerating in the most commonly used speed ranges, and the adoption of a 6DCT gearbox in place of a CVT. Road noise is minimised by high-insulation rigid bushes in the front subframe, high-strength steel in the rear wheel arches and additional insulation in the A- and B-pillars. The low drag co-efficient (Cd) of 0.30 contributes towards the suppression of wind noise, aided by laminated windscreen glass, a cowl over the front windscreen wipers, specially profiled door mirror casings and – as an example of the attention to detail of Kia's engineers – covers over the holes in the roof rails, which sit flush with the bodywork. 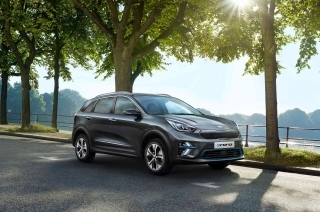 The Niro PHEV is equipped as standard with the best of what Kia has to offer in the areas of connectivity and advanced active driver aids. There is Forward Collision Avoidance Assist, Smart Cruise Control, Lane Keep Assist, Hill-start Assist Control and a Speed Limiter. An 8.0-inch touchscreen navigation system with European mapping, a reversing camera and Kia Connected Services featuring TomTom® ensures the car is fully connected, and there is a wireless mobile phone charger to power mobile devices without the need for cables and connectors. And an eight-speaker JBL Premium sound system with a 320-watt external amplifier provides concert hall-style in-car entertainment. A DAB radio able to support Bluetooth smartphone connectivity and music streaming is also standard, along with Android Auto™ and Apple CarPlay™ which, via pre-downloaded apps, link smartphones to navigation, music, hands-free calls and texts and voice recognition services. City, which can avoid low-speed urban accidents at up to 13mph. Inter-Urban, which operates between 31mph and 50mph. Pedestrian, which detects pedestrians and other vulnerable road users such as cyclists at up to 44mph. Smart Cruise Control maintains the distance to the car ahead, automatically slowing and accelerating the car in accordance with the flow of traffic. Lane Keep Assist uses a camera behind the rear-view mirror to 'film' the lane ahead of the car. It then passes this information to an electronic control unit which detects the lane and markings. If the control unit recognises that Niro has left its lane with no indicator activated, it issues sound and visual alerts to the driver and steers the car back into its lane if necessary. Niro PHEV owners have access to an 8.0-inch navigation touchscreen with European mapping and a Traffic Messaging Channel. These are linked to a reversing camera integrated with the navigation screen. It also features Kia Connected Services featuring TomTom®. This provides live traffic updates, refreshed once a minute, with suggested alternative routes to avoid congestion; local weather forecasts; local searches under 500 categories, from Kia dealerships and petrol stations to restaurants and supermarkets; and alerts for such things as speed cameras and accident blackspots. Kia Connected Services is free for seven years from the day the car is bought. Kia Connected Services is also linked to Android Auto™ and Apple CarPlay™. Android Auto™ works with Android smartphones running 5.0 (Lollipop) or higher and connects the user's smartphone to the car's infotainment system. Through pre-downloaded apps, it then gives access to a variety of services such as Google Maps navigation, Google Play music, hands-free calls and texts and voice recognition. Apple CarPlay™ functions with iPhone 5 or newer and enables full Siri voice control of the phone's apps and functions while linking the car to Apple Maps, calls and text dictation, music streaming and audiobooks. The Niro PHEV is Bluetooth-enabled for hands-free phone calls and music streaming and has a DAB radio with MP3 compatibility, while an eight-speaker 320-watt JBL audio system with subwoofer, external amp and front centre speaker is standard. There is also a wireless mobile phone charger, located in the centre console tray, which uses inductive charging to power the batteries of compatible electronic devices. Occupants are therefore able to recharge mobile phones or MP3 players without the inconvenience of wires and connectors, which frequently change when new devices are introduced. The wireless charger features foreign object detection, switches on automatically when a phone is placed upon it and displays the phone's charge status in the instrument cluster. An in-built safety system prevents overheating, while drivers and passengers are warned if they are about to leave the car with the phone still on the charging pad. With its SUV/crossover design, the Niro PHEV is not only a hybrid car which offers buyers low-emissions, low-cost ownership, but also a desirable model in its own right. It is a stand-alone model in the Niro range powered by a new 1.6-litre direct-injection (GDi) unit from the Kappa family, specifically engineered for use in hybrid cars, paired with a 44.5kW (60bhp) electric motor and a six-speed dual-clutch (6DCT) automatic transmission driving the front wheels. The PHEV is based on the mid-range (grade ‘3’) Niro parallel hybrid (with ADAP). In addition to the long list of driver aids and connectivity systems, it is equipped with a 4.2-inch colour TFT supervision cluster, a reversing camera and front and rear parking sensors, roof rails, privacy glass on the rear windows and tailgate and LED tail lights and daytime running lights. It also features 16-inch alloy wheels with aerodynamic plastic covers, dual automatic air conditioning, an automatic windscreen de-fogging system, all-round electric windows and electrically adjustable folding door mirrors with LED indicators. A DAB radio, USB and AUX ports, a leather-covered steering wheel and gear shifter, black leather upholstery, chrome interior and exterior door handles, rain-sensing front wipers and an under-floor tray are also standard. The front seats and steering wheel are heated and there is eight-way power adjustment and powered lumbar adjustment on the driver's seat. order on trims where not standard. Kia's ultimate goal is to decarbonise road transport completely, and the company is actively working on – and planning to market – all forms of alternative powertrain, including a hydrogen fuel cell car, before the end of the decade. But at present hybrids, and especially plug-in hybrids, offer the best alternative to purely combustion-engined vehicles because they are least dependent on expensive investment in new infrastructure to support them. With CO2 emissions of only 29g/km and officially rated fuel economy of more than 200mpg, the Niro PHEV will play a significant role in helping Kia achieve a 25 per cent reduction in fleet emissions by 2020, based on 2014 levels. It also brings considerable cost savings for both private and business motorists: Vehicle Excise Duty is £0 in the first year and £130 thereafter, while Benefit-in-Kind taxation for business users in 2017-18 is only nine per cent. Businesses enjoy a 100 per cent capital write-down allowance, and the car is exempt from the weekday London congestion charge. 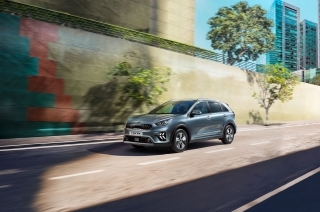 As with every Kia, repairability has been engineered in from the start of the design stage to keep insurance costs to a minimum, and the extensive catalogue of advanced active safety features also helps to lower insurance. Servicing intervals mean that most owners will need to visit a dealer only once a year. And the car is covered by Kia's unique seven-year or 100,000-mile transferable warranty. Servicing is required every 10,000 miles or once a year, whichever comes soonest. 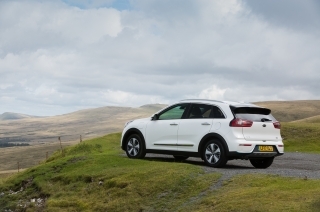 The Niro PHEV is available with ‘Kia Care’ service plans, which have been developed to provide customers with a wide range of service plan options for any Kia model within the first seven years of the vehicle’s life – matching its industry-leading seven-year warranty. Kia set a new benchmark in 2007 when it launched the cee'd with an industry-best seven-year warranty. That demonstration of faith in the quality and reliability of Kia products has subsequently been extended to cover every model, including the Niro PHEV. All versions of Niro are built alongside the European Optima saloon and Sportswagon at Kia's Hwasung plant in Asan Bay, South Korea. Hwasung is Kia's largest factory, with a production capacity of 600,000 cars a year. It opened in 1989 and manufacturing began in 1991. Hwasung is also home to a 200-acre proving ground with 16 driving courses, opened in 1993, and it houses an employee sports centre, giving the 12,000 workers and their families access to gymnasiums, swimming pools, squash courts and weight-training and community facilities. In recent years Hwasung has undergone major changes to improve the quality of production processes and the cars leaving the factory gates. The improved quality has been recognised by the American publication, Consumer Reports. Constant efforts are also being made to minimise the plant's effect on the environment. There have been major initiatives to increase recycling, reduce the amount of pollutants and waste in the production process, lower greenhouse gas emissions and cut air pollution through more eco-friendly production systems. Energy-saving measures have also been introduced, and Hwasung has not sent any waste to landfill since 2008. New technology is playing a significant part in environmental improvement. Typical cast melting furnaces produce large amounts of dust and contained within this is a high proportion of zinc. The captured dust is treated and the zinc extracted before being re-used within the production process. Hwasung is also instrumental in the development of end-of-life treatment technologies to reduce the environmental and social impact of the company's cars. It is home to Kia's major Automobile Resource Regeneration Centre, which not only dismantles cars once they are no longer serviceable, but is also helping to devise new ways in which cars are designed and assembled, as well as with the choice of materials used in manufacturing. Modern cars contain explosive materials to trigger their airbags in an accident and large quantities of environmentally hostile solids and liquids, which must all be recycled or disposed of safely. Metal components such as the car body, engine and gearbox are relatively easy to recycle, as is the battery and exhaust catalyst, but plastics and rubbers present a greater challenge. Now only 5 per cent of a scrapped car is incinerated without energy recovery. Kia has developed an eight-stage dismantling process at Hwasung's ARR centre to recoup as many materials as possible for re-use while ensuring the few components which cannot be recycled are disposed of with the minimum environmental impact. Once the car to be scrapped has been registered it is taken into an explosives chamber, where its airbags are triggered in a spectacular display of pyrotechnics. The car is then pre-treated for scrappage before all fluids are removed. The exterior, interior and powertrain components are systematically removed in sequence and finally the remnants of the car are crushed in a press. The ARR centre works on a conveyor system, just like when cars are being made, so that large numbers can be dismantled and recycled in a short time span. The overall effect of the many green initiatives has resulted in Hwasung being officially recognised as an eco-friendly work site by the Korean Ministry of the Environment. What is the importance to Kia of hybrid vehicles? A. The hybrid market is growing rapidly, not just in the UK but in Europe, too, and we want a share of it. But of greater significance, all manufacturers have to lower average CO2 emissions to 95g/km or less in Europe by 2020-21, and electric and electrified vehicles are essential to achieve this. We also have our own internal targets of a 25 per cent reduction in average CO2 emissions, based on 2014 levels, by 2020. Why do you offer both a dedicated hybrid and a PHEV? A. Hybrid technology, and particularly the batteries which support it, is expensive, and while there is a growing number of buyers wanting to buy into the technology and demonstrate their environmental credentials, not all can benefit from some of the tax advantages it bestows. So, the dedicated hybrid allows those who want a hybrid but gain little reward from a plug-in to reduce their running costs at relatively little expense, while the plug-in will benefit business operators and users hugely with its 200mpg-plus potential fuel economy and 29g/km CO2 Benefit-in-Kind taxation for business users is only nine per cent in 2017-18. Will there be a battery-electric Niro? A. We have been so encouraged by the take-up not only of Niro but also by the Soul EV that we plan to expand our Niro range and EV offerings in 2018. The EV will be another big step towards our goal of achieving a 25 per cent reduction in corporate average CO2. What level of sales is Niro achieving in the UK, and is it mostly a fleet or a retail car? A. We are on course to beat our initial target of 2,500 sales of Niro in 2017 now that we have the plug-in version in the range. The vast majority of PHEV sales will be to fleets, for cost and taxation benefit reasons. Is the Niro PHEV on sale at every Kia dealership, and can all dealers service it because of the extra safety demands when working with electric components? A. Every Kia dealer has at least one technician plus a Kia Master Technician trained in handling the high-voltage systems associated with electrified cars, so the PHEV will be sold at, and can be serviced at, any Kia dealership. Model-specific training is also provided at two-day courses to coincide with the launch of each Kia electric and hybrid vehicle. Kia Motors has made a number of improvements to the Niro, its best-selling electrified crossover range of ultra-low emission vehicles. 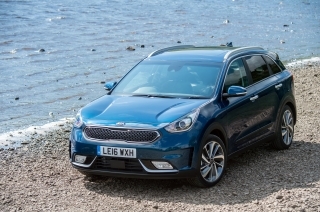 Before it hits Kia showrooms across the UK, the all-new Kia e-Niro has won two DrivingElectric awards including the inaugural Electric Car of the Year award. The first all-electric crossover by Kia also picked up Best Compact Electric Car. Kia Motors (UK) Ltd is recalling certain Kia Niro Hybrid and Niro Plug-in Hybrid models, produced between 1 November 2016 and 11 September 2017 due to a potential issue with the hydraulic clutch actuator (HAC). Kia Motors (UK) Ltd. is delighted to announce two wins at the Next Green Car Awards 2017, with the all-new Niro Plug-in Hybrid (PHEV) winning in the Crossover category and the all-new Optima Sportswagon PHEV winning in the Estate category. Kia is today adding a plug-in hybrid (PHEV) version of the Niro crossover to the parallel hybrid models launched in 2016. The PHEV is priced at £27,995 on the road after taking into consideration the Government plug-in car grant of £2,500.